A pragmatic, truthful account of life and incidents – amusing and otherwise – in the mini-world of Sathya Sai Baba – not censored by Sai officials or authorities! Many visitors from abroad arrive already indoctrinated by stories, books and videos in the hope being helped or healed by Sai Baba (self-proclaimed God Incarnate). Some few appear to get health improvements, but by far the majority get nothing, and one can see many of the same invalids who attend hopefully year after year sitting at the back of the crowds on the stone benches gradually getting worse. They also get an exotic cultural experience and the hope of being healed or helped by the supposed ‘Divine Healer’. Westerners usually arrive with their heads stuffed with all manner of illusions about ‘spirituality’, excited at seeing all the parasitic sannyasins, fakirs, soothsayers, yogis, astrologers, nagas, priests, religious mountebanks and swamis (out of ca. two million wandering mendicants) of whom the vast majority are out-and-out (but often very clever) frauds. One also meets more peculiarly confused, unrealistic and suffering people visiting there from India and abroad than any of the followers ever admit or dare write about. Many are lazy self-seeking spiritual seekers?Though Sai Baba proclaims that it is futile to stay there if one is not doing service to the needy and suffering, many Westerners who stay there (very often those disillusioned and lost in their own lives and societies) laze about and indulge themselves in doing little or nothing other than follow the daily routines of endless waiting to see Sai Baba (called ‘darshan’) or queue for a room, for information, for food at ashram shops, even for a place in another queue or perhaps for any small free handouts going (note: Sai Baba has received billions of US dollars in donations so ‘holy crumbs’ fall on visitors wanting ‘a blessing from Sai’ too!). The Divine Show-off The God who says that he alone among all knows that he is God sails by, now in a bizarre motorised silver traditional Indian chariot (a converted jeep! ), now in a Mercedes or a Jaguar, now standing majestically in a golden chariot tugged on ropes by rows of serf-like figures… all the while making nonchalant royal gestures with a mostly superior and unconcerned, sometimes apparently bored, gaze. Around him on the hard ground or harder marble flooring (depending on the locale) sit cross-legged devotees who have awaited his appearance for several hours at the least. These are also said by him to be gods, yet gods who are unaware of this fact (even though he tells them) and who are mostly worthless as devotees (in his repeated railings) and who are 90% faithless, sub-human and many of whom he later says are ‘demons’ (those who eventually leave him and criticize him). He tells them to ‘Wait! Wait!’ and motions those who raise onto one knee or to their feet to stay down, down! Like faithful dogs ‘Sit!’ For ‘He’ is God not dog, like you and I!My wife got to know very well a lady who stayed at the ashram while her husband went back to the States and waited about one year every day for Sai Baba even to speak to her, poor soul! If he had not done so he would have looked very bad before everyone who knew her desperate waiting like a sore thumb for so long. Wonderland or Disneyland? Paradise or Purgatory? Life or death? Sathya Sai’s original and chief ashram, now the independent township of Prashanti Nilayam – a fiefdom over which he rules completely – is supposed to be “The Abode of Supreme Peace”… a sanctuary from worldly problems full of saintly people. The meaning of the Indian word ‘ashram’ is a place of ‘no hardship’ (‘a-shrama’). So it is should be a refuge from the cruel world. However, it is far from being any utopian retreat! The forceful, pushing crowds, the discriminatory culture (VIPs or nobodies and all in between), the physical, mental and emotional hardships one is made to suffer all help to ensure that. One elderly Indian devotee in the IAS (Indian Administrative Service) – Mr. V. Ramnath who wrote the excessively hagiographical book ‘Waiting for Baba’ – had long experience of the ashrams and many officials and residents (about which he carefully omitted any of the many negative facts he told me). He assured me it is “a snake pit of jealousy”. The former Head of Administration for over 20 years, Mr. Kanhaia Jee, also told me many such incidents and home truths about the ashrams – not least that the Prashanthi Nilayam (‘Abode of Peace’) staff “fight like dogs” when Swami’s back is turned! V.K. Narasimhan (above left with R. Priddy right in 1998), who was present at the ashram and was himself in daily contact with Sai Baba from 1980 until shortly before his death in 2000, unburdened himself of shocking information in a lowered voice and in strict confidence to the present writer. Only after his death could I relate what I had learned (for the sake of protecting him in his very delicate and insecure position living in the ashram under Sai Baba’s control). Other relevant notes to the issue were recorded here and here. ‘Murders in Sai Baba’s Bedroom’ available from author B. Premanand. Send US$40.- (free postage) by money order or bank draft. Two of Sathya Sai Baba’s attendants, his valet Radhakrishna Menon and a young male servitor, were allegedly killed by five intruders in a knife struggle (though that the intruders killed anyone is contested from study of the official evidence by B. Premanand). Four intruders were trapped, and – after some hours and ashram and negotiations with the police – were gunned down inside Sai Baba’s rooms. 1 ) The refusal of the ashram and Sathya Sai Central Trust authorities to lodge any complaint on the six murders in Baba’s quarters. 2 ) Suppression of the news of the murders by the police for 12 hours, of the post mortem reports until after burial/cremation, and of trying to refuse access to the press to the FIR (First Incident Report), which later proved to be wholly uncorroborated and obviously false on many specific counts. 4 ) The mandatory magisterial probe and the CBI (Criminal Bureau of Investigation) reports were not completed and nothing of substance was made public, while the entire murder investigation was closed down by a confidential Government order, the remaining evidence of which is that no charges have been registered and no official report has ever appeared. 5 ) Many illegal irregularities during the investigation occurred. There were: very inadequate search of the scene of the crime; failure to question many eye-witnesses of events (hundreds of local inhabitants, ashram residents and visitors, many MBA students who entered Baba’s quarters while the 4 alleged assailants were still alive, whoever it was who took the injured attendants to the hospital, and others, including Sai Baba); the Central Bureau-CID permitting the Puttaparthi police to search the ashram after expiry of their authority to do so; totally conflicting reports of where poison was found. 6 ) Refusal by Prashanti Nilayam, Puttaparthi, ashram authorities to allow the two injured attendants (A. Patley and V. Bhatt) whom they kept under heavy security to give evidence (except in secret to the CID) and attempt – by removal to a secret location – to cover up the inexplicable and unexplained existence of a boy student in his early teens (Subbappaypa) in Sai Baba’s room who opened the door and gave him the alarm. The CID interrogated Subbappayya twice, despite the ashram authorities demanding they present a valid authority to do so. Was this because sexual abuse was involved? 7 ) Failure to secure material evidence such as large sums of money in notes, bullets fired by the police, and the concealment of material evidence like photos of actual and alleged injuries, the bedding of the four assailants who were to sleep on guard at the Puttaparthi mandir (Sai Baba’s temple where the events occurred) that night. 8 ) No explanation as to why the bodies of the guards killed were found on the ground floor, when the assailants had reportedly crept up to the 1st floor and knocked at Sai Baba’s door to deliver a supposed telegram. Nor would the investigators explain how the alleged assailants entered Sai Baba’s quarters when the door had already been bolted from inside (by either Subbappayya or by Sai Baba?). 9 ) Why were the video film and colour photo negatives and positives of the bodies and crimes scene asked for by the Puttaparthi police later impounded by them? (However, despite this, colour prints have survived and have been published). The photos show a blood-stained lathi (police baton), pieces of rope in blood pools around two of the bodies, while the other two bodies have no blood around them, gloves lying neatly beside bodies of two who would have had no time to take them off having been shot through the head and heart at close range. Much has been written about the murders in Sathya Sai’s private apartments on June 6, 1993, involving cold-blooded police executions in his bedroom. 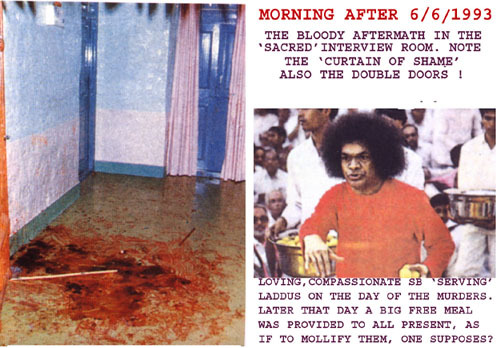 Two of Sathya Sai Baba’s attendants, his valet Radhakrishnan and a young male servitor, were allegedly killed by five intruders in a knife struggle (though that the intruders killed anyone is contested from study of the official evidence by B. Premanand). Four intruders (armed with knives) were locked into Sai Baba’s bedroom apartment for hours and – after some hours and ashram and negotiations with the police – were gunned down inside Sai Baba’s rooms in a hail of dozens of bullets by the Puttaparthi police. Since there has been no court case whatever, many questions remain. An investigation by the Central Bureau of Investigation (CBI ) was begun because the Puttaparthi police investigation was patently untrue and proved to be concocted. Higher authority hindered the CBI investigation by re-posting the two chief officers in charge before they could officially deliver their findings. It was eventually quashed by government authorities, without any known results. That a major cover-up has taken place cannot therefore be reasonably denied, though Sai devotees like Mr. Chris Parnell of the Australian Sathya Sai Organization argue – against their own better knowledge – that it was all satisfactorily cleared up. This was a preposterous and despicable deception so as to try to save Sathya Sai Baba and to dupe devotees into keeping faith with him! Fame for Sai Baba or notoriety? Sathya Sai Baba has claimed that the killings in his bedroom would only increase his fame! However, since then he and his (untruthfully claimed up to 100 million) followers have – with a couple of exceptions – remained totally silent about this! That is remarkable! The murders are a strictly tabooed subject in the ashrams and members of the Sathya Sai Organization are forbidden to mention the event in public! At the same time, others have not been silent. One who has spoken forthrightly, in this case to the BBC was the Home Secretary of Andhra Pradesh, where Sai Baba lives, Mr. V.P.B. Nair, and in charge of the State police at the time. Tanya Datta: So are you suggesting that the police executed the boys that night? VPB Nair: In absolute… this is absolute cold-blooded murder. Tanya Datta: Some police officers were arrested but never charged. The case was eventually dropped. Sai Baba has always had a close relationship with the police. Even today, senior officers are special guests at the Ashram. With friends in such high places Sai Baba seems to be untouchable. Any attempt to investigate the goings-on at his Ashram – even, murder – appear doomed to failure. Critics say police connections ensured that Sai Baba wasn’t even interviewed, despite being one of the witnesses to the events of that night. Indian journalists were censored and their stories suppressed. Increased positive fame for Sathya Sai Baba has not resulted, but increased ‘notoriety’ certainly has! So much for yet another of his so-called “infallible Divine Predictions”!